The causal factors for the very high species diversity in tropical rainforests have been the focus of ecological research for several decades. It has become obvious that the high tropical species diversity has three major components, local (often called alpha-diversity), regional (beta-diversity), and landscape (gamma-diversity). Contribution of each of these components to overall diversity might vary from place to place, and from taxon to taxon. The pattern of variation in plant diversity is of particular interest since this would have a profound impact of the distribution and abundance of secondary consumers. In this study, I examine the nature and extent of spatial variation in the species diversity of woody plants in the rainforest of the Western Ghats mountain ranges in south India, one among the eight most threatened biodiversity hotspots of the world. 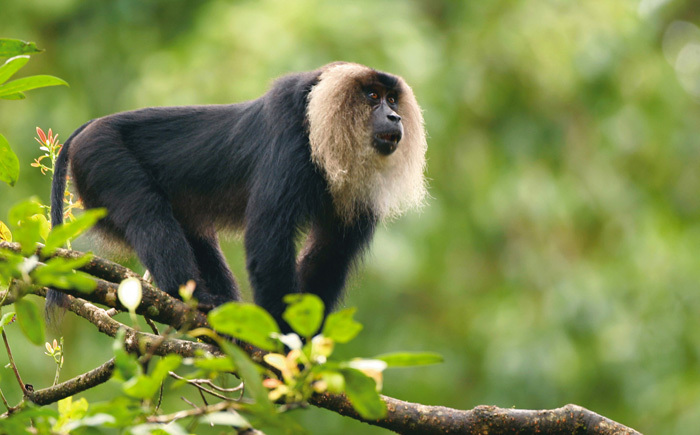 I also examine whether the diversity of food trees of the lion-tailed macaque (Macaca silenus), an endemic to the tropical rainforest of the Western Ghats and phylogenetically the ancestor of all extant Asian macaques, also show variation at different spatial scales that is similar to that of all wood plants. Since the phenology of plants also affects the secondary consumers, this issue is examined at one site. Although the Western Ghats mountain ranges extend over 1600 km, from 8°-21' N, this study was restricted to the tropical rainforest between 8°30’ and 14°17’ N within an altitudinal range of 100-1500 m, which formed the habitat of the lion-tailed macaque. The rainforest north of this is also heavily disturbed and highly fragmented. The variation in the woody plant community was examined primarily with reference to their species richness, density, and basal area. The above study area was divided into four zones, and plants were enumerated from 12 belt transects (250x10 m, 0.25 ha) in each zone, and 48 belt transects in total (12 ha). Species richness was examined at the plot level, as well as pooled at the zone level. Sorensen and Morisita-Horn's indices of overlap were used as an indicator of species turnover at different spatial scales. The study was done from 1994 to 2000. There were totally 391 species, representing 210 genera and 64 plant families, with 5443 individual stems contributing to a basal area of 552.41 m2 in an area of 12 ha. The species richness varied from 14 to 51 with a mean of 35.02 species per plot. Although there was no latitudinal gradient in species per plot, zonal species richness showed decline from Zone 4 to 1. Species richness was correlated although weakly with altitude, as did density and basal area. The pristine rainforests in the southern Western Ghats are confined to the higher reaches and hence species richness is higher at higher altitude. This could explain the higher densities and basal areas also in higher altitudes. However, at altitudes higher than that sampled, this may not hold true. Many of the dominant plant families in the study area were dominant in other parts of the world. The girth-class frequencies decreased monotonically with an increasing girth classes that were in concordance with other studies in India and elsewhere. However, the percentage of woody plant species in the higher girth classes decreased from south to north. The distribution of most of the woody plant species (65.99%) was spatially clumped or aggregated while 22.25% were randomly and 11.76% were uniformly dispersed. Although, alpha-diversity (species/plot) did not vary among zones, beta-diversity (between plots within a zone) was high in all the zones, especially in the southern part of the lion-tailed macaque habitat. The patterns exhibited by Sorenson and Morisita-Horn similarity indices were similar. The gamma-diversity (between plots in different zones) was the highest between Zones 1 and 4, which was expected because they occupy the extreme limits of the lion-tailed macaque habitat. As is the case with any ecological study on plant communities, an estimate to determine the overall species richness including 'missing species' was attempted. Various recent models, which take into account turnover of species, were used to estimate this, and Harte's Self-similarity model was selected as the best one. The estimated overall species richness of trees was 853 compared to 823 species that are currently known from the Western Ghats. However, this estimate is limited to the study area (8°30’ and 14°17’ N). In this study special attention was given to the plant species that are used by the lion-tailed macaque as a food resource. A total of 114 woody food species were recorded during the survey, compared to 218 species reported as food sources. The food species recorded formed 29.16% of all species recorded from all the zones. However, the lion-tailed macaque food-species formed 39.5% to 41.5% of the total species richness in each Zone. The food species richness was not correlated with altitude or latitude. The density and basal area of the lion-tailed macaque food-species for the entire habitat was 54.60% and 62.18% respectively. Unlike the species richness and density, the food species basal area was correlated with altitude and latitude, although the variance in basal area accounted for by these gradients was quite low. The Ficus (fig) densities were also calculated and it was found that their density decreased from north to south. Cullenia exarillata, an important food species, was dominant in the southern part of this macaque?s habitat, above 700 m. The flowers of this trees species, much favored by these macaques, is available during periods of general fruit scarcity. This tree species could serve a pivotal role on these macaques and could be a limiting factor along with several Ficus species. Phenology of 584 trees from 129 woody plant species was monitored in a lowland rainforest of Someshwara Wildlife Sanctuary, Karnataka for a period of 2 years, from 1997 to 1998. The presence/absence of vegetative and reproductive parts were recorded from 2 to 12 trees per species in two trails of 4 km and 12 km respectively. Phenological pattern was examined with reference to percentage of individual trees as well as species. The general fruiting patterns were more or less similar between years but that of the food species of the lion-tailed macaques were not. The fruiting of the food-species was more or less predictable although there was an inter-annual difference in fruiting. The eight Ficus species that were also monitored fruited in all the months of the years. The phenological pattern was similar between years for all species together. However, there was significant difference between years in the percentage of food species that fruited, showing that overall fruiting need not reflect food availability for a specialized frugivore like the lion-tailed macaque. The finding that, basal area of food trees show spatial variation is significant for the continued existence of the lion-tailed macaque. The areas best suited for these macaques, based on this parameter, are: Indira Gandhi Wildlife Sanctuary and Kalakkad-Mundanthurai Tiger Reserve in Tamil Nadu, Silent Valley National Park and Periyar Tiger Reserve in Kerala and Sharavathy Valley Wildlife Sanctuary and Kudremukha National Park and its adjacent areas in Karnataka. It is interesting to note that the rainforests of Madikeri (Coorg), although quite big (ca. 700 km2), have the lowest lion-tailed macaque densities and poaching could be the reason attributed to this. The rainforests in Western Ghats harbor very high species diversity. This is basically due to a very high beta- and gamma-diversity. Although alpha-diversity is also very high it is not correlated with latitude. Species richness decreased from the northern limit of the lion-tailed macaque to its southern limit. The food species richness of the lion-tailed macaque mirrored the general pattern. Higher girth classes were observed from the southern limit of this macaque's habitat. Krishnamani, R. (2002). 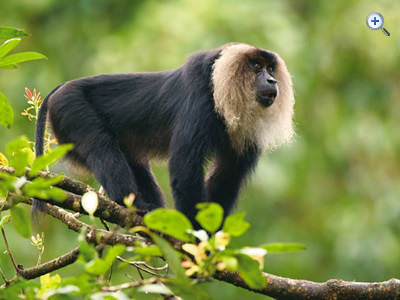 Phyto-ecology of the lion-tailed macaque (Macaca silenus) habitats in southern India. Ph.D Thesis. Bharathiar University, Coimbatore.